Shell a crab and and make a geng1 from the meat, using its juices for braising. Do not add and chicken extracts since it is best to cook it on its own. I’ve seen vulgar cook adding duck tongue, sharks fin, or sea cucumber, which not only robs the crab of its flavours but add an irritating fishiness to the dish. A complete abomination! 1: A geng 羹 is a class of rich Chinese soups thickened with starch. Shark fin does not soften easily and needs to be boiled for around two days before it is supple enough to eat. 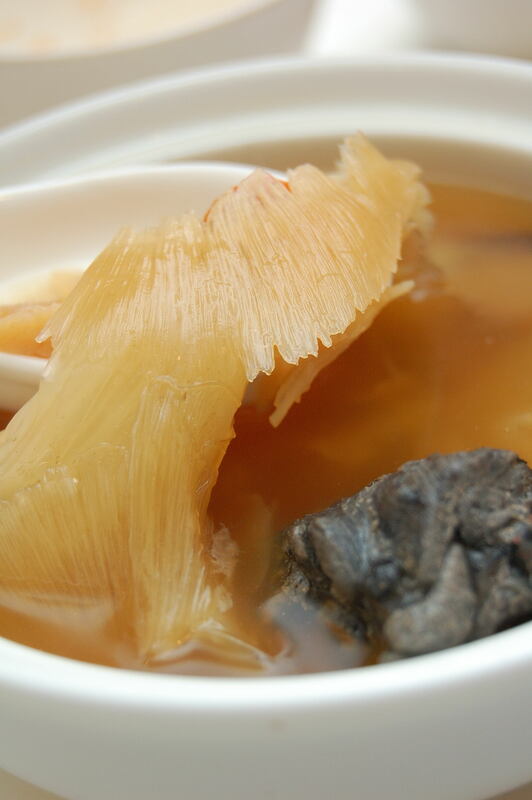 There are two ways of preparing shark fin; the first involves simmering it with good ham, good chicken broth, fresh bamboo shoots, and a few grams of rock sugar. The second way uses only chicken broth and finely shredded radish with the shark fin pulled apart into shreds. When cooked, both radish and shark fin meld together in the bowl such that a diner cannot tell one apart from the other. The method using the ham has less liquid, while the method using radish has more. A well prepared shark fin must be a harmoniously balanced in its smoothness and suppleness. If one serves sea cucumbers that flicks one’s nose and shark fin that bounces off the plate, it would be told as joke amoung one’s guests. When Taoist Wu serves shark fin at home they do not use the bottom scale containing portions and prefers to use only the thicker top portions, a rather unique method of preparation. The shredded radish used for shark fin must be immersed and soaked in water twice in order to remove its odour. I have also tasted the shark fin and vegetables stir-fry at the home of Guo Gengli, which was superb! It is too bad they did not pass on the technique for preparing this dish. The requirements of cleaning and washing specific ingredients are as follows; one must remove all feathers from bird’s nest, remove all mud from within sea cucumbers, remove all sand from shark’s fin, and wash the foul smells from deer tendon. If the meat contain sinews, one needs to remove them such that the meat can remain tender after cooking. Duck kidneys have a foul odour , therefore be sure to remove them and rinse the cavity well. Be careful to not break the fish’s gall bladder when gutting and cleaning the fish since doing so will render the entire dish bitter. If one does not wash away the saliva of an eel during its preparation, the resulting dish will have an unpleasant fishy odour. One must remove the old leaves when cleaning garlic chive, leaving only the tender white stems. When preparing leaf vegetables, one should remove the coarser outside leaves and use only the heart. In Nei-Ze (禮記::內則) it is said: “One should remove the orbital bone around a fish’s eyes and remove the orifices  of the soft shell turtle.”, admonishing us to diligently clean the ingredients for a dish . The common proverb: “If you want a fish to taste good, you will have to clean it extremely well.” , also highlights the truth behind these facts. : One can also read the text as “Ducks have a foul urine-like kidney odour, make sure to clean it (and it’s insides) well to remove the smell.” So, either the duck’s kidneys smells bad, or the duck has bad kidney smells. Your pick. : I have no idea what “醜” are. It says here they are “perforated openings of the turtle”. What does that even mean? Nostrils? Cloaca? Mouth? Ears? I’m going saying “orifices” here for the sake of generality. : The full text is in here. Basically, the whole sentence tells what to do with animals in cleaning and preparations. Did you know you should remove the head of a badger and the intestines of a wolf when preparing them? I didn’t. : The Chinese text says “To make fish taste good, wash it until the white tendons/nerves come out”. Basically what’s being said here is that you have to wash the fish very well, right? At first I thought this was indeed the case and the white tendon part was simply exaggeration for humour. That is, until I read this. It appears that there ARE long white strands of nerves tissues that you have to remove from each side of the spine near the gills to really rid a fish such as carp of its strong fishy smells.